Notes on surfing and improvisation – FACE THE UNKNOWN. DISCOVER THE OTHER. 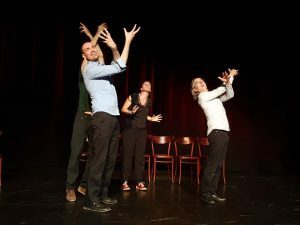 The title of this article is inspired from a book I took with me on a surftrip to Peru: “Impro: Dynamics of the unexpected – notes on impro and football”. I love this book and warmly recommend it to all improvisers. I think it’s a very smart and beautiful work. It even brought me to a nostalgic tear, remembering my days as a child playing endless football matches on the street. Feña Ortalli makes an amazing comparison between teamwork, playfulness and risk taking in football and on stage. Two years ago I took my first surf class and I immediately fell in love. From the first wave on I knew that, even more than dancing, surfing would be my next improvisation master. There’s a beautiful similarity. Not exactly in the same way as with football. Maybe the football comparison is more of a masculine metaphor, and surfing (or at least my little comparison here) a feminine one. Sidenote. 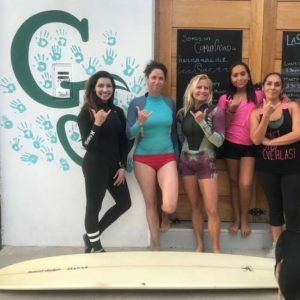 this organisation brings girls and women to the waves. When we went out together with a group of Hermañas de Surf on Fluro Friday, each of us shared what surfing in the oceans brings us. This is a beautiful example of what Mary Overlie calls “listening to the news of a difference” in her Six Viewpoints concept for dancers and actors. Studying subtle differences in things that look the same at first sight, makes us more sensitive and open to new possibilities and helps our creative and artistic mind grow. 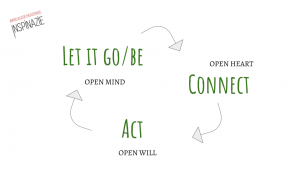 This is the improvisation cycle we use as a main concept in our Living Impro trainings (improvisation principles in life and work). I never felt it as embodied as on those waves. The moment you increase your peddling with the wave behind your back, you have to let everything go. No way you’ll be able to think about what you’ve just learned. You can only feel in the now-moment, letting it sink deep into your body. Then comes the moment the wave catches you (who’s catching who anyway). You exhale and through the board you create the closest contact possible between you and the wave. Feel it, listen to it. And notice that this stillness needs to happen in the midst of the chaos and energy of hard peddling, while you’re checking your direction, watching out for other surfers, and snot might be running out of your nose. And then, GO. Decide. Precisely and quick, but not in a hurry. Pop up. As an improvisation theatre ensemble we are the waves on stage. We trust each other’s movements, even when offers are awkward or wild or slow. We leave enough space for each player, for who he/she is and how they play. And we pop up in each moment of the story we build together. And this is how a good improvisation performance feels: not forcing pieces together, but riding the story that is already there. It wasn’t all as romantic as described in the paragraph above. For the first time in my life I struggled with falling in love with the sea. It took me some time. Being in the water every day, and especially as a beginning surfer (peddling more than average time, with your eyes and nose right in the water at the shallow part), is a reality check on everything you see in the media on ocean pollution. Other than with forests being cut away, the devastation is hidden under the waterline. This makes our oceans extra vulnerable. Let’s bring more attention to the people, programs and organisation that are doing great and important work to stop these disasters. For instance, check out the website Save the Waves. 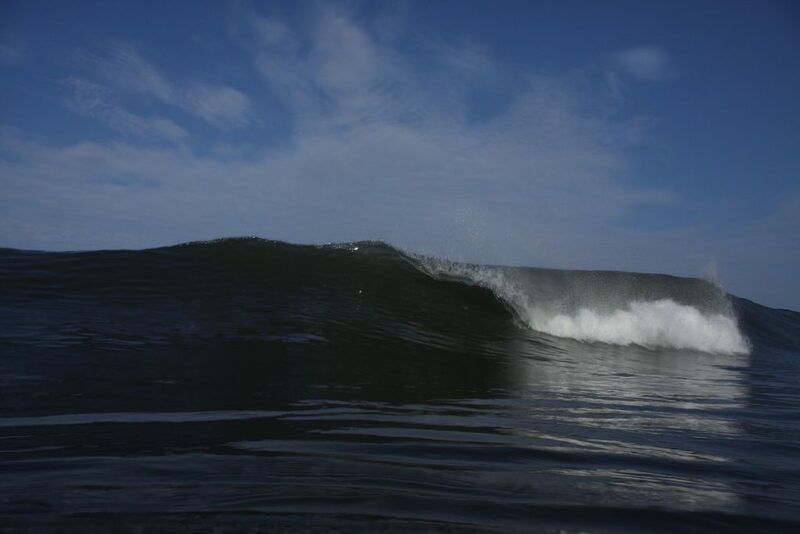 And also check Unleash Surf, the amazing organisation I stayed with in Peru. I believe that bringing people to the waves in any way is a very important stepping stone in raising respect for marine life. And clean sea water around the globe can give more people that amazing blue ocean mind, a healthy state of creativity and connectivity. Previous Post:Hoeveel scripts speel jij in het leven?